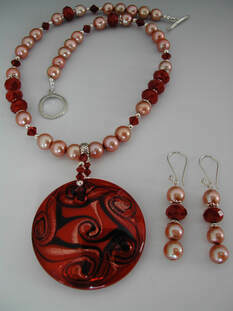 Necklace and earring set: Double strand necklace is 18" twisted (shown) or 19" untwisted. Features cross-drilled white, dark red and bronze freshwater pearls interspersed with Swarovski crystals and sterling silver end beads at the slide clasp. Because all of our products are individually created we recommend that you contact us at Helen.PearlsbyHelen@gmail.com if you would like to purchase this product so we may verify inventory. We'll respond quickly with instructions. 21" necklace with mother of pearl beads and pendant, white freshwater pearls and gold-filled findings closed in front by a gold-filled toggle and loop clasp. ​Because all of our products are individually created we recommend that you contact us at Helen.PearlsbyHelen@gmail.com if you would like to purchase this product so we may verify inventory. We'll respond quickly with instructions. 20" necklace featuring Magnesite (white turquoise) ovals, (blue) turquoise beads, white freshwater pearls, silver plated findings and a pewter toggle clasp. Complementary earrings (not shown) have the same small ovals, turquoise beads and white pearls and hang from sterling silver hooks. 18" necklace featuring a 52mm circular red and bronze toned glass pendant with 8 mm bronze freshwater pearls, 10 mm facetted ruby quartz beads, red Swarovski® bi-cone crystals and sterling silver findings and toggle clasp. clasp. Earrings have gold-filled lever-back clasps. we may verify inventory. We'll respond quickly with instructions. Send mail to Helen.PearlsbyHelen@gmail.com with questions or comments about the products or this web site.